Our manufacturing and production location is in the proximity to seaports and airports. It helps us in delivering any consignment of pistons, piston rings and other automotive products on time as per our customer’s requirement. SAMKRG has four major and highly specialised plants at different locations. 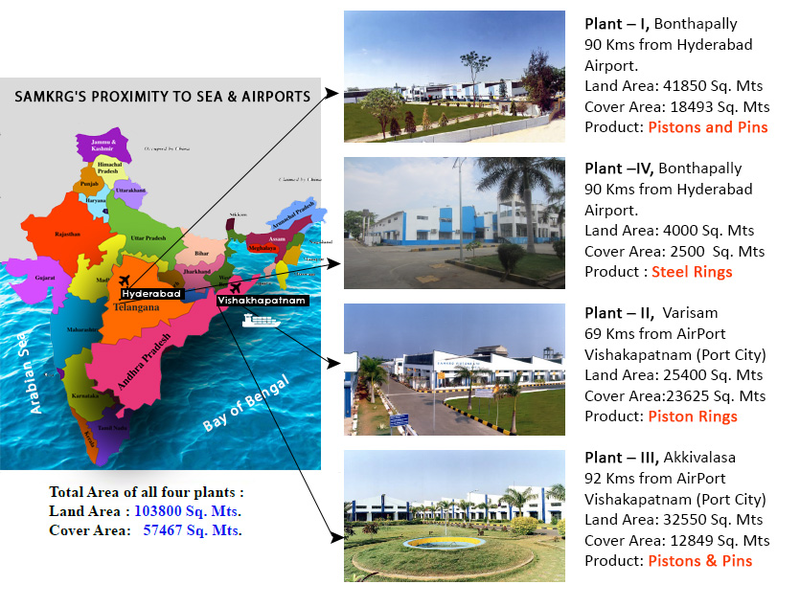 Two plants which specialise in production of Pistons & Pins, and steel rings respectively are located at Bonthapally, 90 kms from Hyderabad Airport. Two other plants which specialise in production of Piston Rings and Pistons & Pins are situated at Varisam and Akkivalasa respectively, and are in proximity to the port city of Visakhapatnam.